My first Deer Tales post…. On July 11, 2011 our family set off on a journey unknown. We had packed up all our stuff, made two truck runs, and left city life. We purchased a 33 year old home in the rural area known as the Chaparral Subdivision. So, we sort of belong nowhere, but to everyone. We live in the rural of rurals. Dirt roads in every direction. The nearest city is over an hour away. Why did we do it? I’ll explain that later. Are we getting accustomed to rural life? Let’s just say it’s been an adventure. And that’s what part of this blog is about. Our adventures. I started House-Wise in 2010. I was enjoying my blog and facebook pages. 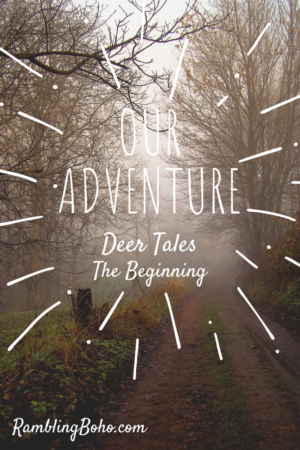 But in 2011, I started Deer Tales, a blog about our adventures out here. Since then I’ve merged House-Wise and Deer Tales to become the Rambling Boho. It’s about life and home. We just do it from a rural perspective now.